David Landry’s Inquiry into the New Testament has everything desired in a textbook: crystal-clear explanations, beautiful page layout with gorgeous pictures, key terms and discussion questions at the end of every chapter, fascinating sidebars, and above all a keen sensitivity to the literary and historical contexts of the New Testament, as well as its contemporary significance. With its finger right on the pulse of current New Testament scholarship and well-designed for the academic setting, this textbook will benefit both student and teacher. Highly recommended! I cannot recommend this textbook highly enough. 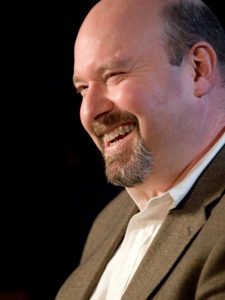 David Landry has composed an ideal introduction for students who will encounter the New Testament in a single semester as part of a general education curriculum. Students will be equipped with all the necessary technical, historical, scholarly, and theological resources to read the New Testament critically. Most impressive and useful in the way it marries methodology with specific text, this volume allows students to gain an in-depth understanding of each biblical book and to develop the critical skills to read the New Testament on their own. The volume includes a range of carefully considered digressions on relevant topics, helping students think through issues and recognize the New Testament as a book rooted in the past but speaking to the present. Students will be well positioned to read and think about the New Testament, to enter upper-division seminars, and to reflect on how these early Christian texts remain important for their lives and for the world around them. A useful and user-friendly text for undergraduate study of the New Testament. While clearly based on the most up-to-date scholarship, the presentation will be especially helpful for students approaching the Bible critically for the first time. The text never falls into excessive jargon; the style is clear, with complex issues neatly developed. Landry’s first few chapters on the background to the New Testament texts are comprehensive yet compact. Discussions of such issues as document dating, canonical development, comparison of canonical and noncanonical gospels, and the task of critical inquiry are all helpful. Time and again, I found this text fit well with my own presentation of the material and the range of students I encounter in my classroom. It has the real feel of classroom experience. I can see myself using this textbook very successfully, and I think other teachers of the Bible would find it similarly useful. David Landry and John Martens provide a thorough and accessible introduction to the New Testament replete with images, review and discussion questions, key terms, and bibliography. The approach is primarily historical and literary. 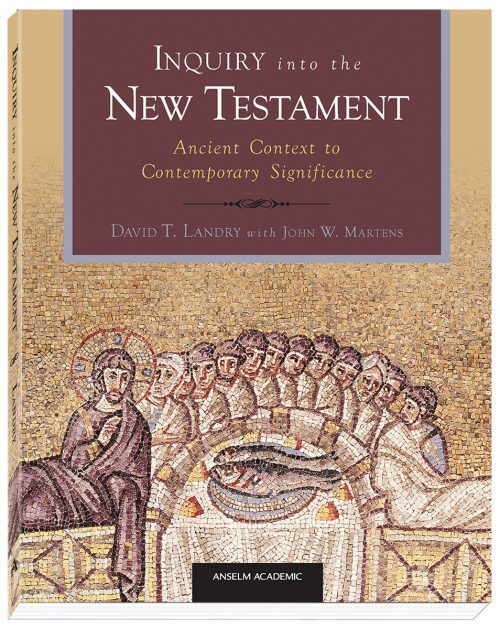 What makes Inquiry into the New Testament distinctive from other introductory texts, however, is its engagement with the ongoing use of the Bible in the contemporary world, whether for good or ill. Landry and Martens address the historical and present-day significance of various parts of the New Testament, and furnish each chapter of their book with discussion questions that sometimes engage controversial issues. Various topics such as fundamentalism, politics, economics, gender, and social and environmental justice come to the fore, especially in the last chapter. The authors effectively demonstrate why the academic study of the New Testament is important, regardless of one’s religious orientation. I highly recommend Inquiry into the New Testament for undergraduate courses. In the overcrowded field of introductory textbooks, Inquiry into the New Testament is a standout. Designed with the undergraduate student in mind, this engaging and pedagogically smart volume explores salient historical, literary, theological, and wider interpretive issues both within and with the New Testament. Reflecting decades of teaching and scholarship, Landry and Martens show why a critical New Testament literacy is indispensable for understanding the power the Bible exerts, for better and for worse, in contemporary culture. Few introductions readily embrace this challenge so directly, and none does so more effectively. It’s a superb choice for the beginning New Testament course and one that will enrich many classrooms for years to come. The enormous cultural impact of the Bible—and in particular, the New Testament—has given people of all backgrounds and traditions at least some familiarity with it. Yet the Bible remains one of the most misread and misunderstood books of all time. Given the sheer variety of interpretive and critical methods, perhaps this isn’t altogether surprising. 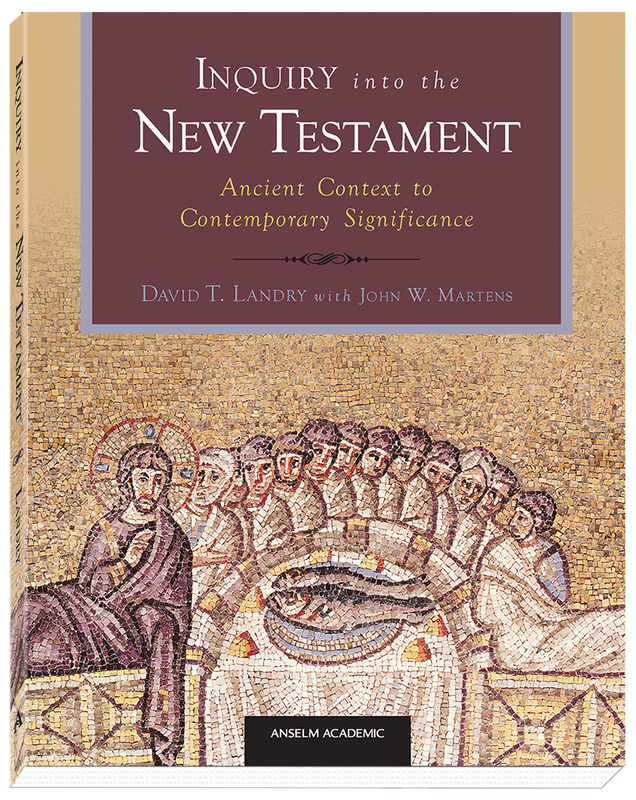 In Inquiry into the New Testament: Ancient Context to Contemporary Significance, David Landry offers a readable, informed, and thorough introduction to this important collection of books. Teachable and ecumenical, the text includes methodological tools, reading guides, key terminology, review and discussion questions, images, and recommendations for further reading that will equip students to understand both Early Christianity and its foundational texts. With sections on literary and historical context, source criticism, interpretive lenses, the formation of the canon, the books of the New Testament as well as noncanonical gospels, and contemporary application, Inquiry into the New Testament highlights not only the ancient importance of the New Testament, but its continued modern significance, as well.